Huangpu River, also known as Huangxiepu or Chunshen River, is a landmark of Shanghai, separating the city into two parts, Pudong and Puxi. With a total length of 113 km (70 mi) and a width of 300-770 m (984-2,526 ft), the river runs through over 10 districts in the city. It is regarded as the Mother River of Shanghai, serving multiple functions including drinking water, shipping, drainage, fishery and tourism. Several submarine tunnels and bridges have been built under and on the river to provide better transportation conditions. On both sides of the river, there gather various styles of architectures and essential scenery. 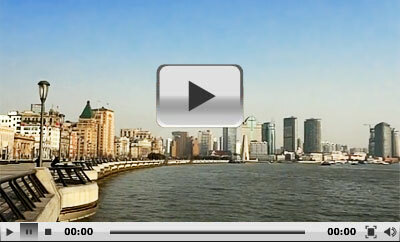 Famous attractions like the Bund and Lujiazui Finance and Trade Zone are located along the river. To enjoy the scenery along the river, the Bund on the west bank and Binjiang Avenue on the east bank are the top two places in the city. Binjiang Avenue is less crowded, but the Bund offers more beautiful scenery. On the Bund, there is a historical architectural complex lining along the road. It consists of abundant buildings in western styles built around 100 years ago, when Shanghai was partially working as a foreign settlement. On the east bank, Pudong, are the tall modern buildings constructed in recent decades. Pudong has become an important financial and commercial hub in the city, even China. The skyscrapers on the east and the classical architectures on the west are in sharp contrast, from which you can have a glimpse on the development of the city in the past century. Across the river, there stand two bridges: Yangpu Bridge and Nanpu Bridge, like two big dragons lying over the water. Between the two bridges, there stands Oriental Pearl Tower in the center. From a bird’s-eye view, the whole picture is like two dragons playing with a pearl, which is one of the unique scenes of the river. Another famous bridge over the river is Waibaidu Bridge on the joint of Huangpu River and Suzhou Creek. It is the largest iron bridge in downtown Shanghai. With a history of hundreds of years, the bridge has witnessed the growth of the city. In a lot of old movies and photos of Shanghai, you can see the image of this bridge. At Wusong Port, there is another special scene: tri-color water. It is the estuary where Huangpu River and Yangtze River meet and flow into the East Sea. The water of Huangpu River from downtown is steel grey, that of Yangtze River is yellow with sands, while that of the East Sea is green, together forming the scene of tri-color water mixture in the flood season. The best way to appreciate Huangpu River is to take a ship cruising on the river, especially in the evening. During the general journey of around 50 minutes, you can enjoy the sights on both sides of the river from a broad view on the cruise ship. At night, the lights are blazing, decorating the different styles of architectures standing on the banks, showing different beauty. If you don’t want to spend too much time cruising on a ship, you can also take a ferry to have a quick trip between Pudong and Puxi in around 15 minutes for a single journey. To the Bund: Take Metro Line 2 or Line 10 and get off at East Nanjing Road Stop. Then walk east to reach the Bund in around 15 minutes. To Binjiang Avenue: Take Line 4 and get off at Pudong Avenue Stop. Leave from exit 1 and walk northward to arrive at Binjiang Avenue in around 5 minutes. Take bus No. 55, 65, 305, 736, 866 or 868 and get off at Shiliupu Wharf Stop, which is the place to take cruise ships. By Sightseeing Bus: Sightseeing bus Line 1, 2, 3 and 5 are all available to reach Huangpu River. What are the available HuangPu river cruise companies and where are their ticket counters? There are many companies for the cruise on Huangpu River and you can buy the tickets at No.532, East Second Zhongshan Road. Which ferry can carry motorcycle from Lujiazui to the bund (waitan),area. And where I can see the daily schedule operation and pricing, please. Thank you. You can walk about 900 meters from Lujiazui to Dongchang Road Ferry Station where you can take the ferry to East Jinling Road Ferry Station. Then walk about 360 meter to the Bund. The ferry schedule is 07:00-22:00 and a ferry leaves every 15 minutes. The ticket price is CNY2. I'm not sure whether you can put your motorcycle on the ferry. And I didn't find any information on the internet. You can ask the staff in the ferry station. do you have the web sites for the different river cruises of Shanghai Huangpu River? Is it worth taking ones that may have diner included and pick up at my hotel-Hyatt on the Bund? You can search Huangpu River Cruise on this website then you may get more information. It will be more convenient to have dinner included but it is a little expensive. If it is worthy mainly depends on your budget.